Maria Waite, aged 65, passed away of natural causes in her Mendon home on August 30, 2018. Maria’s life was devoted to caring for others. She worked as a CNA and cared for a wide variety of animals throughout her life. She completed nursing course work at John Wood Community College and coursework in art and photography from Suffolk County Community College. Born on Long Island, NY, Maria spent her early adult years working at various stables caring for horses and working with riding clients. 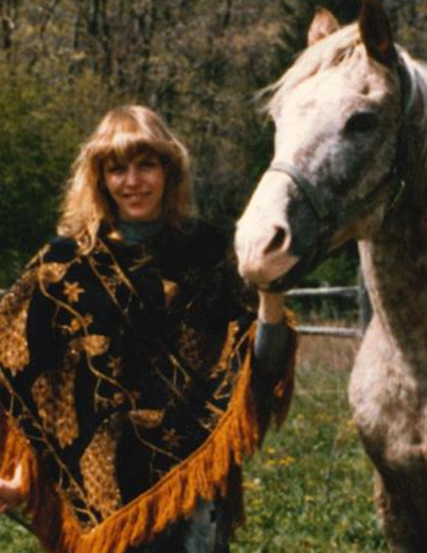 She especially liked working with clients with disabilities and enjoyed seeing horses bring joy to the lives of others. She moved to Mendon, IL in 1999, and enjoyed the small town atmosphere. She was a member of St. Edward Catholic Church. Her family is thankful for the way Mendon residents welcomed and accepted her. She lived her life on her own terms, and people who knew her will not soon forget her and her animals. Maria’s parents, George Joseph Waite and Josephine Marie Jankauskas, predeceased her. She leaves behind her older sister Gail (Pat) of Cochranville, PA and her younger brother Mark (Lin) previously of Mendon, IL as well as 3 nieces (Joan, Macie, Lacie) and 4 nephews (Patrick, Thomas, Lukas, Tyler). Her beloved dog, Fox Mulder, will become part of her brother’s family. Cremation arrangements are in the care of the Zehender Robinson Stormer Cookson Funeral Home in Quincy. Maria's brother and sister will host a celebration of life gathering for her friends at the First Congregational Church in Mendon, Illinois on Saturday, September 15, 2018 from 10:00 to 12:00 Noon, with lunch available at 11:00.